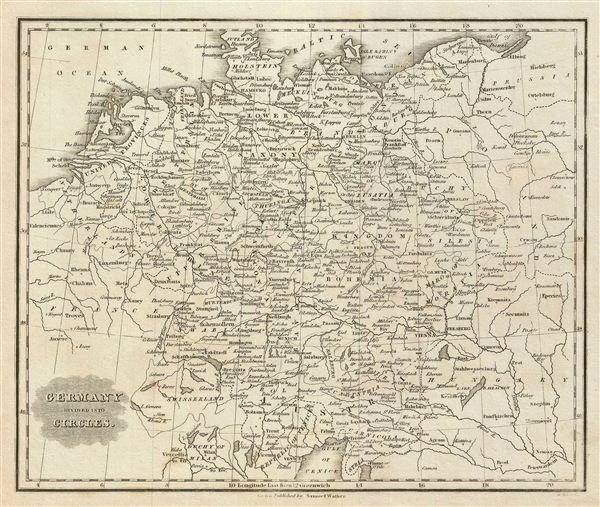 This is an attractive example of the 1828 Malte-Brun map of Germany. The map covers from the Baltic Sea and the North Sea or the German Ocean south as far as the Gulf of Venice, and east as far as Poland, Hungary and Prussia. It covers all of modern day Germany and Austria, and divides the area into the imperial circles devised by the Holy Roman empire to administer, tax, and defend the empire (covering most of what is now Central europe). Various, important rivers, islands, cities and other topographical details are noted. This map was published by Samuel Walker in 1828 as part of the American edition of Conrad Malte-Brun's System of Geography, Vol. I.